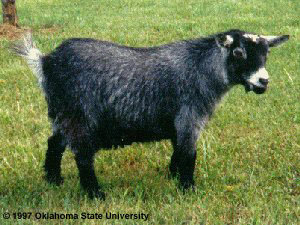 The Pygmy Goat was originally called the Cameroon Dwarf Goat. The goat is mostly restricted to the West African countries. Similar forms of Pygmy goats also occur in all of northern Africa, in the south western African countries, and also in east Africa. 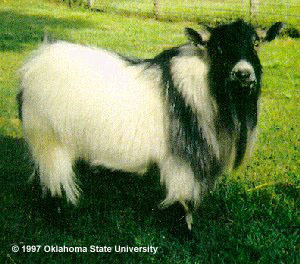 However, what we call the Cameroon Dwarf goat is the one that we are concerned with and have in the United States. It is the breed that actually came from the former French Cameroon area. The Cameroon goats were exported from Africa to zoos in Sweden and Germany where they were on display as exotic animals. From there they made their way to England, Canada, and the United States. In 1959, the Rhue family in California and the Catskill Game Farm in New York received the first documented shipments of Pygmy goats from Sweden. Offspring of these animals, as well as earlier imports, were sold to zoos, medical research, and to some private individuals. A full coat of straight, medium-long hair which varies in density with seasons and climates. On females, beards may be non-existent, sparse, or trimmed. On adult males, abundant hair growth is desirable; the beard should be full, long and flowing, the copious mane draping cape-like across the shoulders. All body colors are acceptable, the predominate coloration is a grizzled (agouti) pattern produced by the intermingling of light and dark hairs, of any color. Breed-specific markings are required: muzzle, forehead, eyes, and ears are accented in tones lighter than the dark portion of the body in goats of all colors, except goats that are solid black. Front and rear hoofs and cannons are darker than main body coat, as are the crown, dorsal stripe, and martingale; except in goats that are solid black. On all caramel goats, light vertical stripes on front sides of darker socks are required.